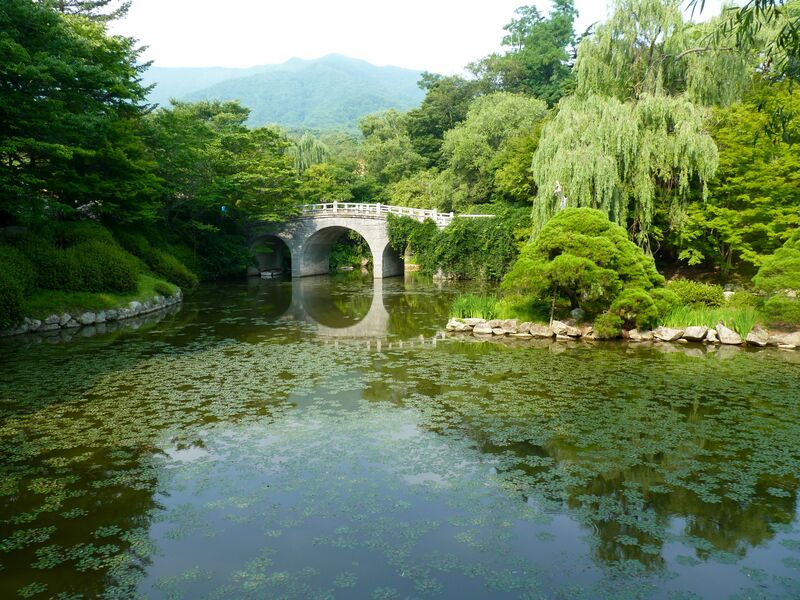 Gyeongju was the capital of the Shilla dynasty for some 1,000 years. Its hilly terrain is home to dozens of Shilla-era tombs, ruins and temples. 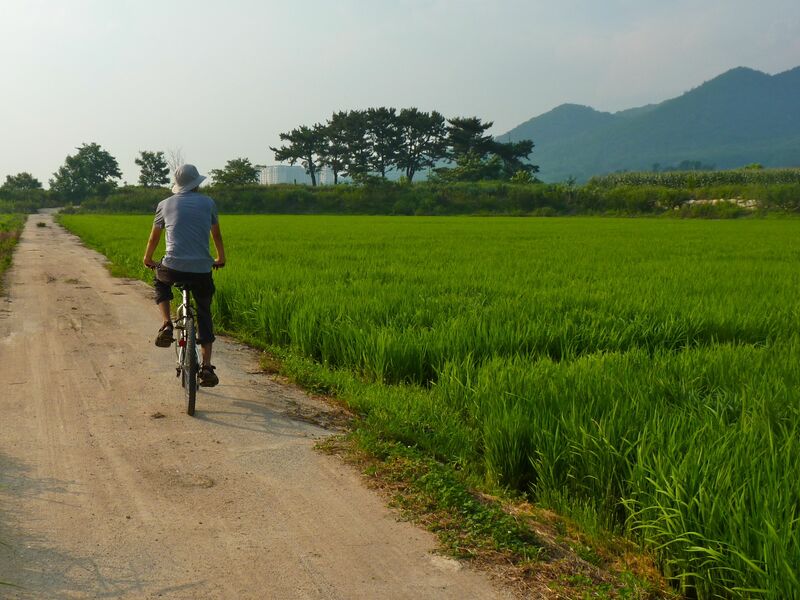 We rented bicycles to better discover Gyeongju’s secrets and its summer colors. The center of Gyeongju is compact with a wide avenue stretching in front of the train station and several perpendicular shopping streets. At Seongdong Market, you can get anything. The fruit is exquisite: bunches of juicy, deep purple grapes are arranged alongside ripe plums and peaches. On-the-go foods like gimbap (vegetables and omelette rolled in rice and dry seaweed) and dukbokki (rice cakes in spicy red sauce) are on offer. 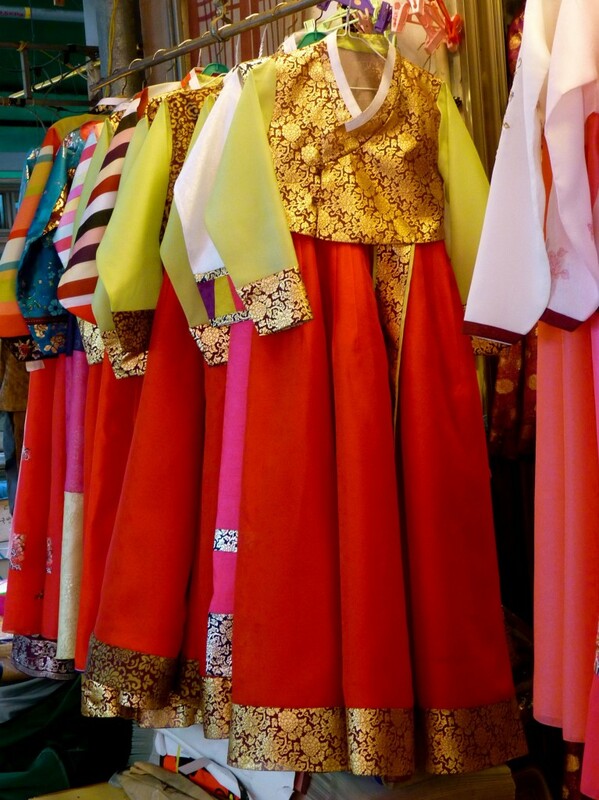 A couple of tailors specialize in chima jeogori – bespoke or readymade traditional dresses in vibrant hues. 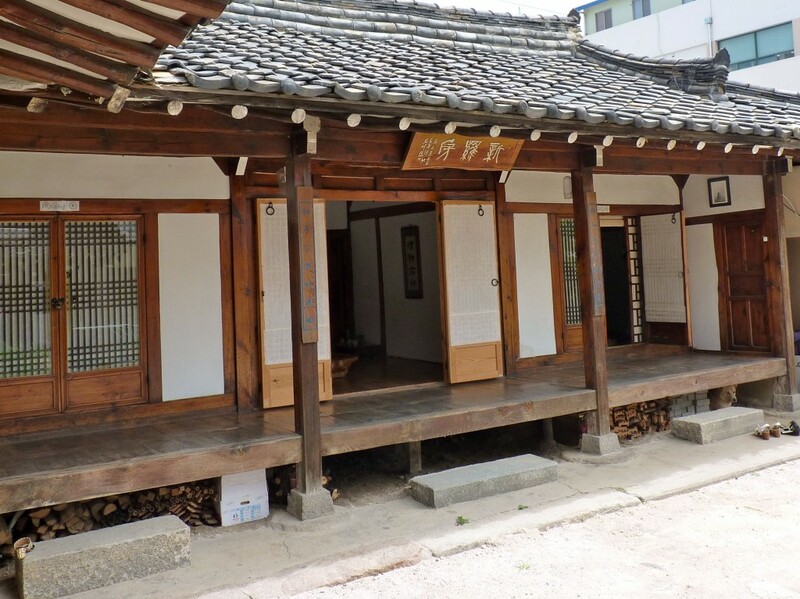 Central Gyeongju may seem to lack character at first notice, but sometimes, a brown and white hanok (traditional Korean home) is hiding behind a big door. A bike lane leads out of the city, to Bomun Lake with its family-oriented theme parks and picnic areas. The hot July noontime sun is beating down but this is not our place. We climb uphill, leaving the city further and further behind, until we come upon Gyeongju Folk Craft Village. 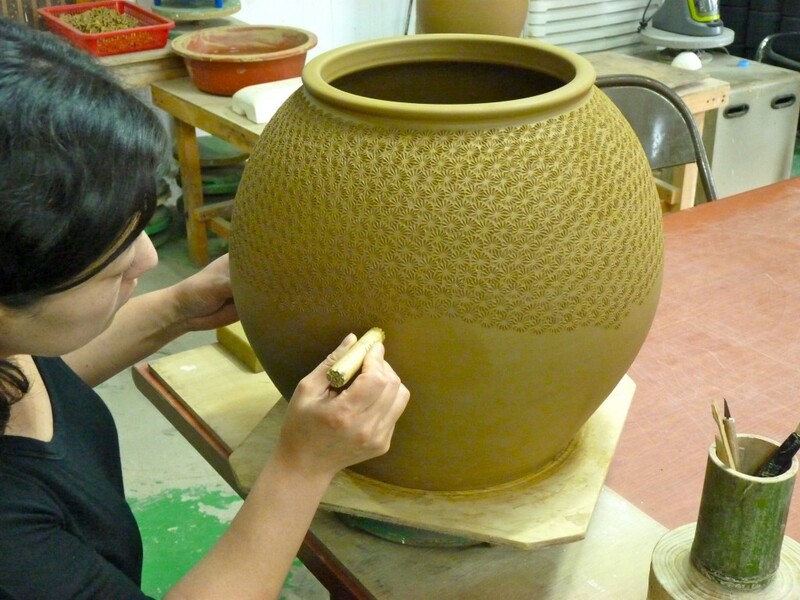 Jewelry makers and potters invite us into their workshops. A few more kilometers uphill take us to Bulguksa Temple, a UNESCO world heritage site. 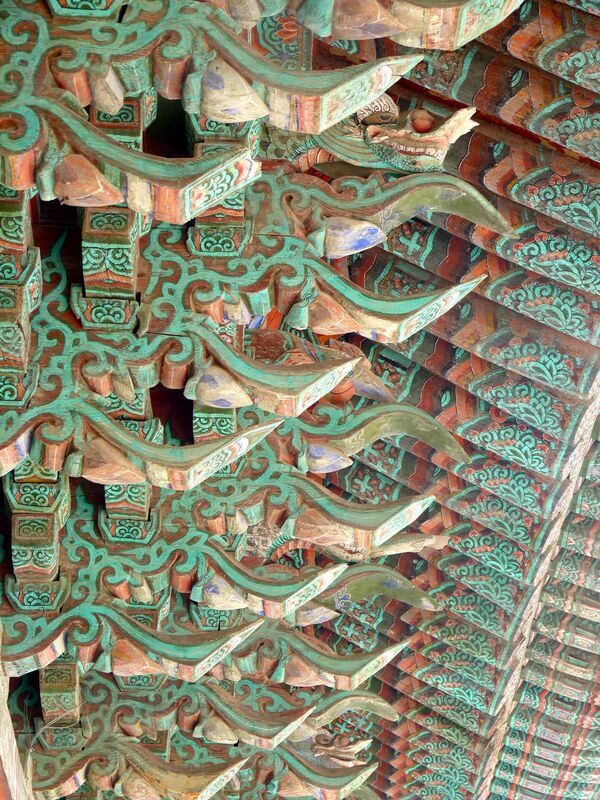 The temple was constructed in 528 and during the Joseon Dynasty it was used specifically for prayers to ward off foreign invasion. The Japanese burned it all down in the Imjinwaeran War (1592-1598). It was reconstructed and renovated between 1600 and 1800, then fell into disrepair until a reconstruction campaign was undertaken in earnest in 1969. An otherwise austere site, Bulguksa is livened by its colorful exterior painting. The quiet grounds around Bulguksa are a good place for a short meditation session on benches in front of a small pond and a white bridge. We follow the train tracks back to Gyeongju. The sun is less intense and a golden, late afternoon light makes the landscape especially beautiful. A small detour takes us through tiny one-street villages and rice paddies. A little over an hour later, we are back in Gyeongju. 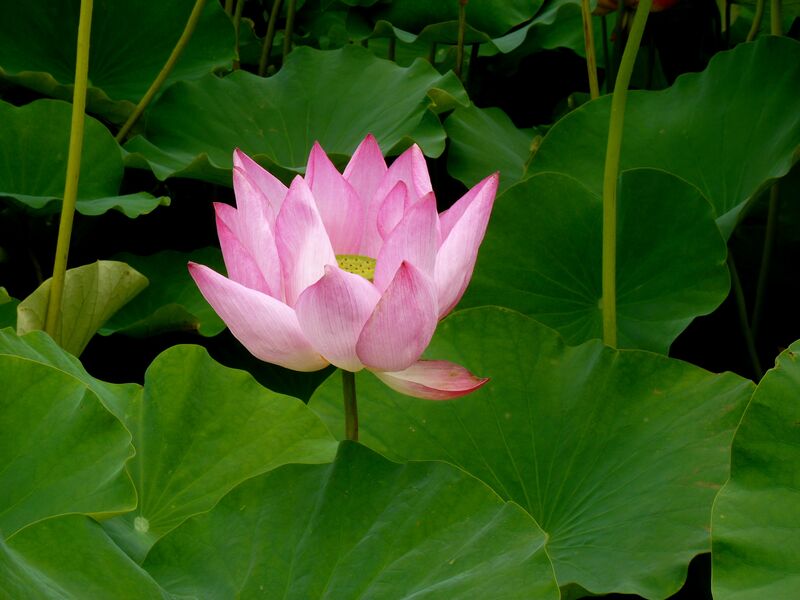 We make a short stop to admire the lotus flowers at Anapji Pond. Small grassy mounds mark the tombs of the Shilla Dynasty at Tumuli Park which have been undisturbed for over 1,000 years. The larch trees are surely not as old, but their gray-brown rock-like bark looks prehistoric. 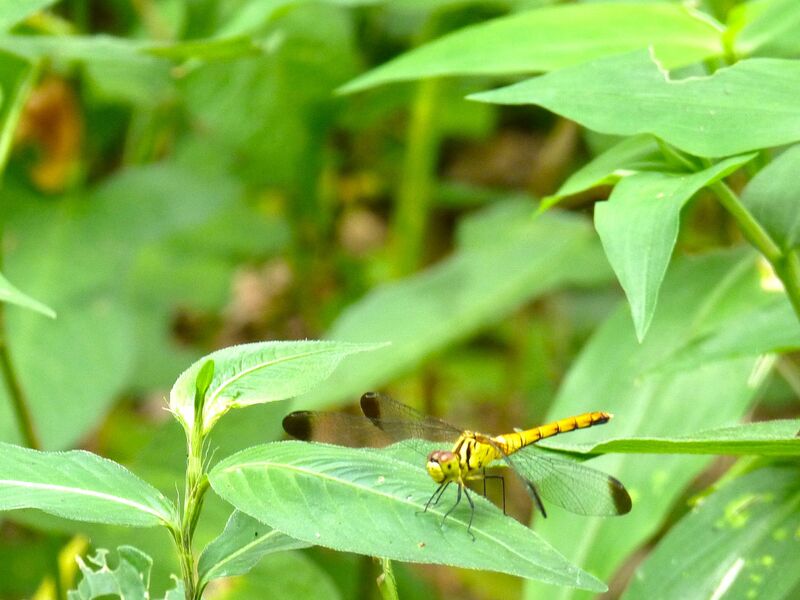 As dusk approaches, yellow dragonflies fill the park with the quiet whizz of their sheer black wings beating. Cheomseongdae Observatory in the park measures time, directions and seasons: 362 stones for the days in a lunar year. For us, it’s been 40 kilometers, seven hours, 1,000 years in a day. Most hostels and guesthouses rent bicycles for 5000 won per day (as of July 2013). Cycling around Gyeongju’s sights and to Bomun Lake is easy and the terrain is flat. Bomun Lake is about 9 kilometers from the train station and well-signaled. From the lake to Bugulksa via Gyeongju Craft Village is another 9 kilometers or so, mostly uphill. It’s not very steep but it is a sustained and taxing stretch. (We are fit but we are not regular cyclists.) There is a sidewalk/bike path and the road didn’t have much traffic. 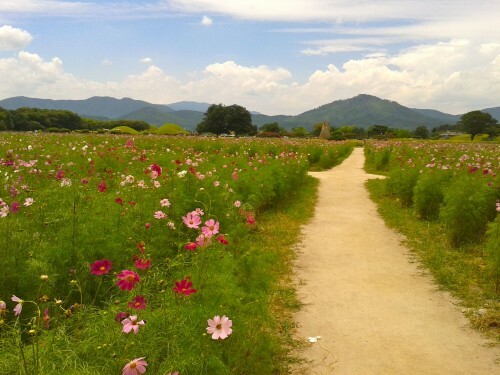 If you want to combine the visit to Bugulksa with Seokguram Grotto, you may want to enquire about the bus timing before leaving Gyeongju or upon arriving to Bugulksa to plan your visit. We narrowly missed the bus from the temple to the grotto, didn’t have enough daylight to wait for the next bus and make it back down to Gyeongju, and didn’t feel like hiking up after the long ride to Bugulksa. The return from Bugulksa to Gyeongju following the railway tracks is mostly downhill next to a busy highway. It was neither easier nor harder nor longer nor shorter than the way up. The map from the tourist office is sufficient to navigate the whole ride.